Problems and diseases to the eyes can be caused in various ways; however, two are the main ones. 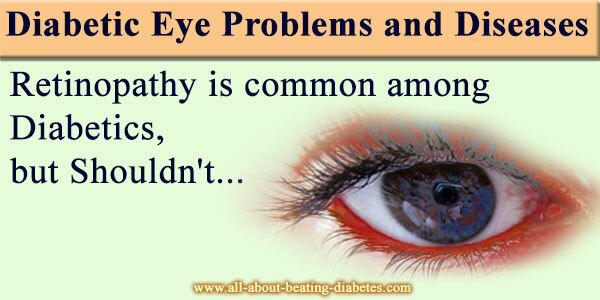 They serve as mechanisms through which diabetes can damage and harm your eyes. The first way is the direct damage of the optic nerve. This can cause a great damage to one's diabetic vision. The other way, is the microangiopathy, which damages the tiny vessels of the eye itself, including the retina (retinopathy). In the first way, the conductive system is damaged, meaning that the image can not be transferred from the eye to the brain; and in the second case, the perceiving apparatus is damaged. However, both of these ways lead to commons symptoms. That’s why it is hard to make the right call what is the first and most damaged part of the eye. Diabetic eye diseases (including retinopathy) are common among people who suffer from diabetes and they have to be familiar with all the symptoms. In most of the cases, patients go to the doctor because they have double vision or blurry vision. Clear distinguish has to be made between those two terms because the first means that you see two objects instead of one. In the other case, you do not see the object’s shape properly. In 80% of the patients this is the first sign of eye problems in diabetics. When you have black spots, this means that the progress of the diabetic eye problems is huge. That’s why the treatment is necessary to be carried out immediately. Other symptoms, indicating that the eye is damaged further are limited peripheral vision, floating circles, flashing spots. Pain in the eye or both eyes indicated that there is an inflammatory process behind your eyes. This inflammatory process makes the pressure higher, which push the eye. That’s why it hurts us. The treatment of the diabetic eye diseases includes medications and surgical interventions. The medications that are in use are corticosteroids. They have anti-inflammatory effect, meaning that they suppress the inflammation process in the eye. The treatment with corticosteroids can not be carried for long period of time because there are some nasty side effects, like gaining pounds, losing bone’s density, hormone problems and etc. This treatment is able to limit the problems. Surgical intervention could be carried out to fix the damaged structures in the eye. When the operation is conducted, diabetes must be controlled very well, otherwise the same old problems will arise. Surgical intervention could fix the eye disease permanently, if they have not progressed very much.